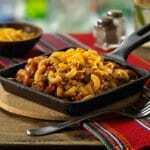 Crunchy Topped Chili-Mac Skillet | JPMA, Inc. In large skillet cook turkey and onion in oil over medium-high heat for 5 to 7 minutes or until turkey is no longer pink, stirring to break up big chunks. Stir in beans, water, salsa, tomato sauce, uncooked macaroni and chili powder. Bring to boiling. Reduce heat. Simmer, covered, about 15 minutes or until macaroni is tender. Stir in 1 cup of the cereal. Simmer, uncovered, for 1 to 3 minutes more or until desired consistency. Remove from heat. Sprinkle cheese and remaining 1/3 cup cereal over top. Let stand, covered, for 2 to 3 minutes or until cheese melts. Ladle onto serving plates or bowls.